My favourite thing about the apartment where we stay on Portugal’s Silver Coast is its marvellous view of the ocean. I’m with my husband, daughter (18) and son (13) at Praia D’el Rey Golf & Beach Resort, around an hour’s drive north of Lisbon. It’s our first time in Portugal, and we start our trip with a few days each in Lisbon (read about it in my post A short trip to Lisbon – relaxing in the Portuguese capital) and in Porto (read about it in my post Our trip to Porto, Portugal’s second city). I love exploring both cities, but I only start to truly relax once we get to the coast. We booked our stay at the resort through James Villas, having been impressed with the apartment which they arranged for us in Dubrovnik the previous year (you can read my review of Dubrovnik Sun Gardens Resort here). 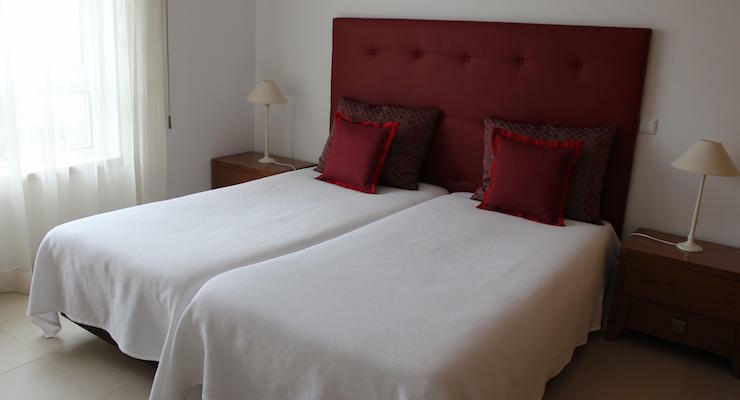 When we travel as a family we like to stay in comfortable, high quality accommodation with good facilities, and I trust James Villas to provide that. The resort is spread out across many acres – it has around 1,400 villas and apartments, a Marriott hotel, an 18-hole golf course, and another golf course planned. The first holiday properties were built here around 30 years ago, and there are still swathes of land waiting to be developed. It turns out that the apartment is actually better for us than I’d expected, because as well as having two bedrooms and two bathrooms, it also has a comfortable sofa bed in the living area, which is where our son opts to sleep, leaving his sister a whole bedroom to herself. They’re both happy with this arrangement, and it greatly reduces the frequency of sibling holiday bedroom squabbles. They’re also happy to discover that the TV has some UK channels, enabling them to keep up with Great British Bake Off and Match Of The Day. The kitchen is very well-equipped, and we end up cooking (actually my husband does, as he really likes cooking) and eating at the apartment more than we eat out. There’s a decent oven and hob, a dishwasher, a large fridge and a freezer as well as a washer-dryer. When we arrive there’s a bottle of wine and some fresh flowers from James Villas to welcome us. There’s also a bottle of water and some teabags and sachets of coffee in the kitchen. Cleaners come to the apartment most days, and they do an excellent job. Wifi is provided in the form of a mobile wifi device which we’re given at reception when we check in. The connection speed varies, and it slows down as more devices are connected, but it keeps the teens happy enough, and allows me to do what I need to do on my social media channels. 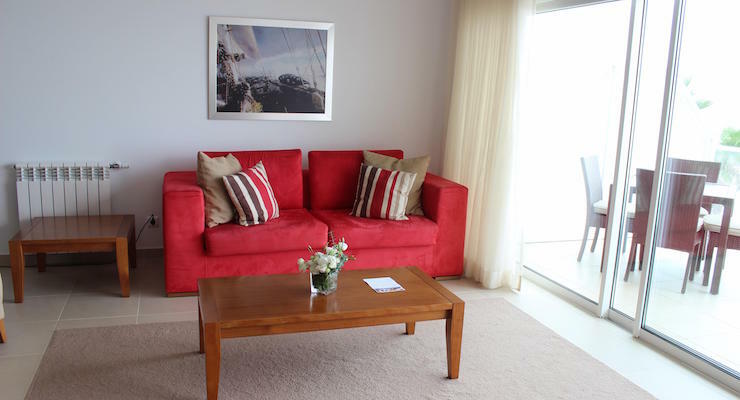 The apartment is on the second floor, with views across a wide sandy beach to the rolling surf of the Atlantic Ocean. I love looking out from the balcony and could never tire of the view. The apartment is above a square with a small grocery shop (when we check in we’re given a 10 euro voucher to use at the grocery shop, but it’s quite limited and we prefer to shop with the locals in Peniche), Argento restaurant, an ice-cream shop and the kids’ club. It’s the end of August, and the temperature’s very comfortable. It’s in the low 20s (apparently this is lower than usual for the time of year), hot enough to sunbathe but not too hot to sleep. This means that I don’t feel that I have to hide my fair skin in the shade for a few hours in the middle of the day. I’m not so keen on the sea fog though – each morning of our eleven-day stay we wake up to find a chilly mist blanketing the resort and hiding the sun. The fog usually clears by lunchtime, so we generally drive somewhere for a morning excursion in the sunny inland areas, coming back to the resort to relax for the afternoon. For the last three days of our stay though, the fog doesn’t shift at all. 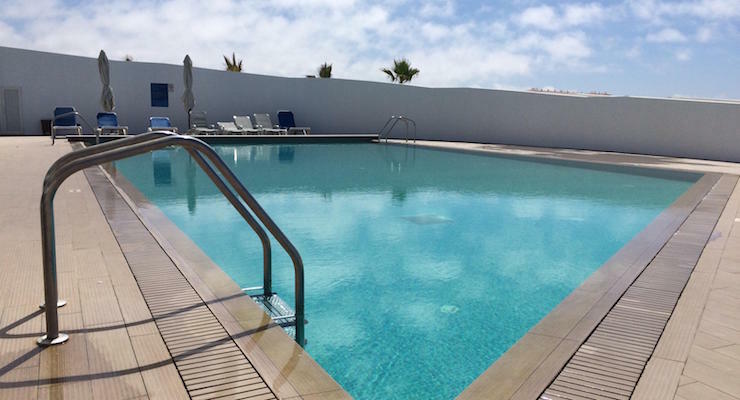 Between the apartments and the beach is a sheltered outdoor pool area for guests to use. There’s a shallow pool for toddlers next to the main pool. There are plenty of sun shades and sun loungers. 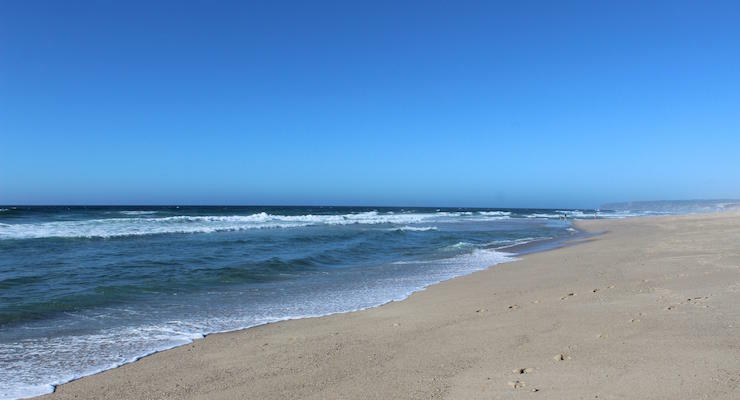 The beach is huge and sandy and is reached via a boardwalk across the sand dunes. The ocean is pretty cold and the waves are quite big, so we don’t actually swim in there, although there’s a lifeguard on duty during the day. The resort provides sun loungers on the beach, but you have to pay 15 euros per day or 10 euros per half day to use them, which I think is pretty steep. We use our beach towels instead (as does everyone else). There’s a kids club at the resort for three to 18 year olds offering a range of activities both on and off-site. Mine have never had any interest in going to kids clubs, so I don’t know what it’s like. 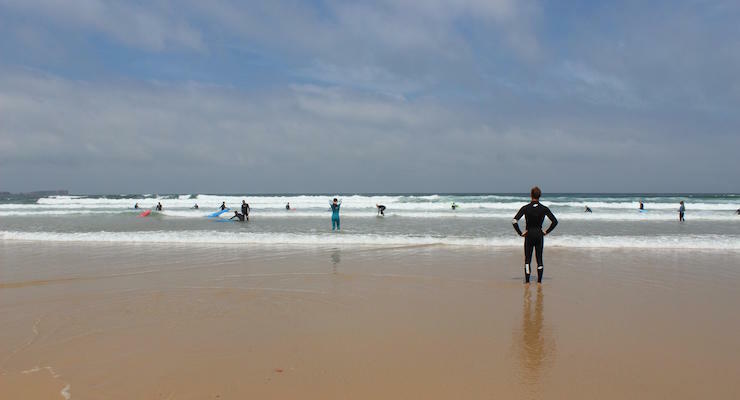 You can hire bikes from the kids club, and they can arrange surfing lessons for you at Peniche. Our son’s excited when we see signs around the resort for a football pitch. We can’t seem to find it though, and when I ask reception about it they tell me that it’s been covered in sand and is being renovated. The resort is well-placed for exploring this part of Portugal – as long as you have a car. It’s quite a way from any shops or public transport. We hired our car from Lisbon airport when we arrived In Portugal. 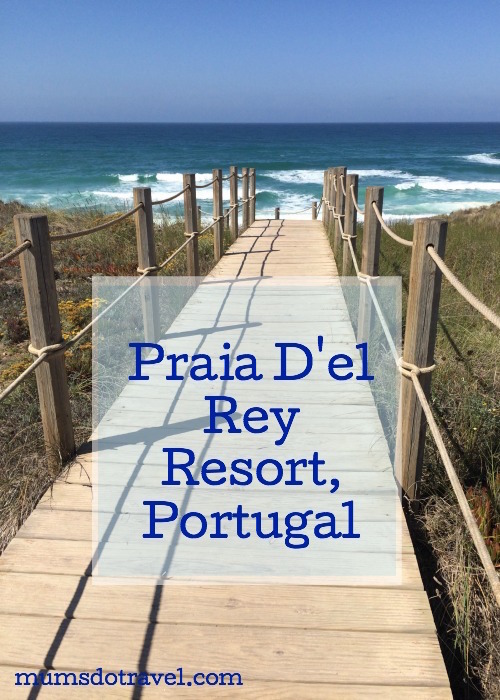 The cities of Lisbon and Sintra are around an hour’s drive away from Praia D’el Rey. 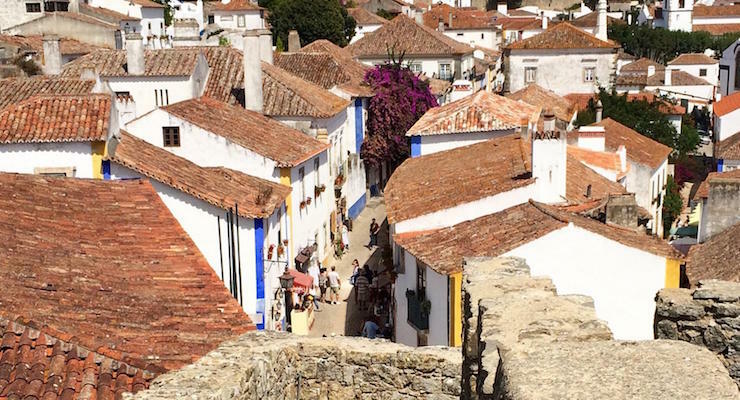 It takes about 20 minutes to drive to the pretty medieval village of Óbidos, which I love. The popular surfer beaches of Peniche are also around 20 minutes away. It takes about 45 minutes to drive to the seaside resort of Nazaré. 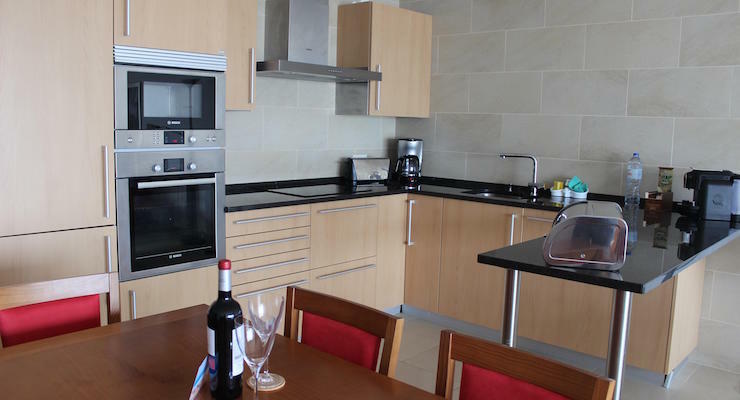 Our two-bedroom apartment cost £1373 pounds for eleven nights, including wifi and pool towels, booked through James Villas. Praia D’el Rey Golf & Beach Resort is a quiet, uncrowded, relaxing place to stay, and the quality of the accommodation is excellent. It was disappointing that it was so foggy when we were there. Disclosure: This post is sponsored by James Villas. We booked and paid for our stay in full. This post contains affiliate links, which means that if you clicked through and booked I may receive a small commission. All opinions, images and words are my own, as ever. How did the golf course look? I have heard Portugal is becoming a wonderful golf destination. I didn’t go to it, sorry! I don’t play golf. Just been reading about your trip to Lisbon and came over here to look at your review of the Silver Coast. I’d love to explore that part of Portugal. I fell in love with Lisbon when I visited and I really want to see Porto! It’s a great area to explore, really interesting. I’ll be writing about Porto soon! well it looks stunning, Portugal isn’t my really on my radar but I love the pictures. The idea of a villa a pool seems very luxurious. Thanks for commenting – it is a beautiful place! What a wonderful insight into your Portugal holiday. Thank you so much for writing such an in-depth review of the apartment, we are so happy you had a wonderful time and love your video, it is so nice for future customers to be able to take a look and get first hand experience from someone who has been. You’re very welcome – I hope that the review is helpful to people who are thinking of staying at the resort. I don’t know this area of Portugal at all but I adore the Algarve and Lisbon so would love to explore it. We are big fans of James Villas and the apartment you stayed in looks great. The beach looks beautiful too (although a shame about the sun lounger charge!). Thank you for sharing, this is definitely on our list to visit now! 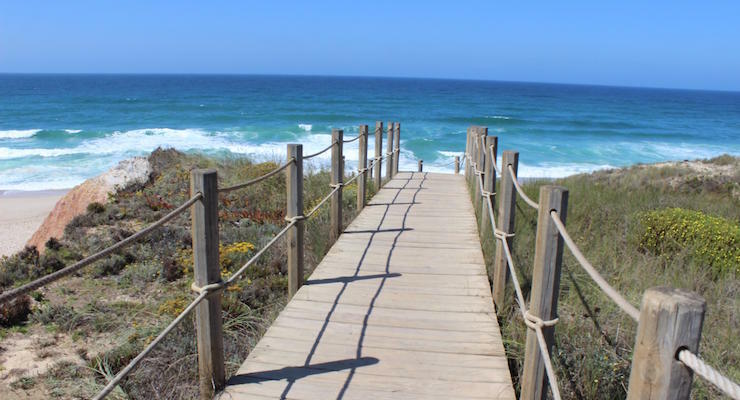 I’ve not been to the Algarve – we chose to go to this part of Portugal as we really wanted to spend some time in Lisbon and Porto before going to the beach. I love the idea that you get your own apartment space within a resort as you still have all the facilities. Being so close to the beach too… that’s an added bonus! Glad you had a lovely time! Yes, apartments like this work really well for our family. The kids need more space now they’re older! It looks gorgeous. Great that it was kept neat and tidy by cleaners every day – and how wonderful to be so close to the beach! I do love being next to the beach – even if the sea’s too cold for a swim! The coast is so gorgeous around here and the resort sounds a great place to relax and enjoy it. Lovely to have this as a base to explore the area as well. I was staying nearby at the same time and the weather was so strange – we seemed to be in a hilly fog pocket and kept escaping to the sunny beaches. I was surprised by the fog, but it was easy to escape from it by car. It was a very relaxing basset stay at.